iPhone 5 Silver / White metal rear case with both glass plates attached. 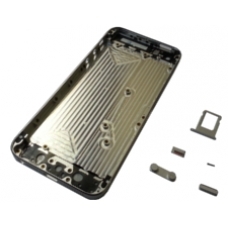 If you have damaged the rear housing on your iPhone 5 in any way, or maybe you just feel like a making your iPhone 5 look like new, this is the ideal replacement rear case part for you! * Includes Power & Volume Buttons, Mute Switch.